The second Hancock was one of the first 13 frigates of the Continental Navy authorized by resolution of the Continental Congress 13 December 1775. She was built at Newburyport, Mass., and placed under command of Captain John Manley 17 April 1776. After a long delay in fitting out and manning, she departed Boston in company with Continental frigate Boston 21 May 1777. On 29 May they captured a small brig loaded with cordage and duck. The next day they encountered a convoy of transports escorted by British 64-gun ship Somerset which set sail to close Hancock. Manley was saved by clever and well-timed action of Boston who forced Somerset to give up the chase by taking on the transports. After escaping from Somerset, the two frigates sailed to the northeast until 7 June when they engaged the Royal Navy's 28-gun frigate Fox who tried to outsail her American enemies. Hancock gave chase and soon overhauled Fox who lost her mainmast and suffered other severe damage in the ensuing duel. About an hour later, Boston joined the battle and compelled Fox to strike her colors. Hancock spent the next few days repairing the prize and then resumed cruising along the coast of New England. East of Oape Sable she took an enemy coal sloop which she towed until the next morning when the approach of a British squadron prompted Manley to set the coal sloop ablaze and leave her adrift. The British brig Flora recaptured the Fox after a hot action. Boston became separated from Hancock who tried to outsail her pursuers. Early in the morning 8 July 1777 the British were within striking distance. HMS Rainbow began to score with her bowchaser and followed with a series of broadsides which finally forced Hancock to strike her colors after a chase of some 39 hours. Hancock, renamed Iris, served the British Navy so effectively that her new owners boasted of her as "the finest and fastest frigate in the world." The most famous of the many prizes which made her officers wealthy men was the American 24-gun ship Trumoull, captured 8 August 1781. Later that year a French squadron in the West Indies captured Iris and used her as a cruiser. When the British took Toulon in 1793 they found Iris dismantled and used as a powder hulk. The British blew her up as they evacuated Toulon. 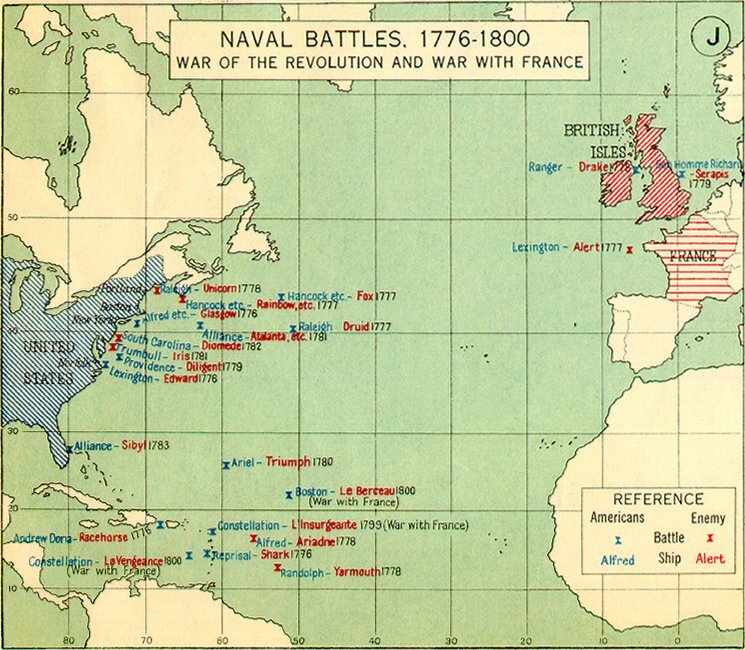 Map, "Naval Battles 1776-1800". Shown as American victory here. June 1777 listing: Not shown. July 1777 listing: Not shown.